Mass-produce all the simples you need based on configurable product parameters in Magento. Use two attributes with an unlimited number of values for each. Quickly generate simple associated products for Magento configurables. 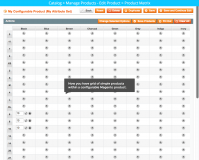 Easily manage a grid of simples belonging to a certain configurable product. Work with 2 attributes with an unlimited number of values each. Generate simple associated products fast and with ease. 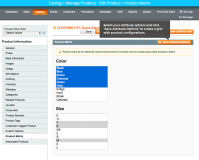 Work with configurable products that have two attributes. For a module that works with unlimited attributes, please see Configurable Products Pro. 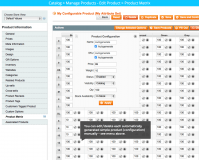 Create a matrix where you can specify simple associated product configuration: name, price, SKU, weight, availability, quantity, visibility and status. Create and edit products’ attributes. 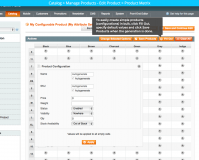 Manage inventory right in the product matrix. Use an unlimited number of options for each attribute. Magento Cross Sell plugin - Take advantage of upselling and cross-selling at your store. + Fixed the issue for restricted Admin-Users with the "Change Selected Options" button. * Incorrect confirmation message is fixed. * SyntaxError: An invalid or illegal string was specified is fixed. + Enables Admin to select a set of attribute values (exclude unnecessary values) before generating the matrix. + Enables Admin to specify the price of simple associated products within the matrix. * IE bugs for Magento CE 1.7 are fixed. * "Clear all" button issue is fixed. * Issue with the layered navigation block is fixed. + Advanced Language Pack with the following languages: - German, - French, - Spanish, - Italian, - Dutch is added. + The extension is compatible with Magento 1.5.1.0. + The extension is compatible with Magento 1.5.0.1. By far the best module ever seen! This extension has literally saved me hours beyond measure. Aside from it's great functionality the customer support is even more top notch. I will only buy extensions from AITOC from now on. I can trust that their quality is top level and that they stand behind their work. I would highly recommend this extension to ANYONE selling configurable products. If you need to put in a lot of product variants, then this module is for you! Absolutely fantastic, it has literally saved me hundreds of hours of putting in associated products. I am setting up an online print store , and if you know anything about printing you will understand the massive amounts of variants needed (even for just one item). The module was a little bit harder to set up then other extensions I have put into my existing (or other stores) but I put this down to my own inexperience. Criticism: the manuals are pretty nigh on useless and need revisiting. AITOC's replies to any queries usually takes 24 hours (which I think should be quicker) but they do respond reliably. Product Matrix looks and feels a quality product, and when I build up my cash reserves, I will look at purchasing other software from their store as needed. Thanks and well done AITOC. Fantastic module! It really shaves off time from creating Configurable products. Support was great and they even listen to the custom needs of the customer for future updates.